What is the Bright Star Monitor Section? 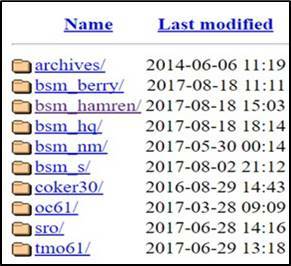 This website provides the member a description of the BSM equipment and processes, useful URL links, and help to propose and conduct successful projects. You can become an active member by following the BSM Section page and subscribing to the AAVSOnet forum. The forum offers members a place to follow current events, BSM Section technical discussions and a clearinghouse for observing projects that will attract professional contribution and collaboration. Would you like to help manage the BSM Section, make your interest known and/or view forum posts for requests for help! The AAVSO Bright Star Monitor telescopes are a subset of the larger AAVSOnet network which are located at sites around the world. 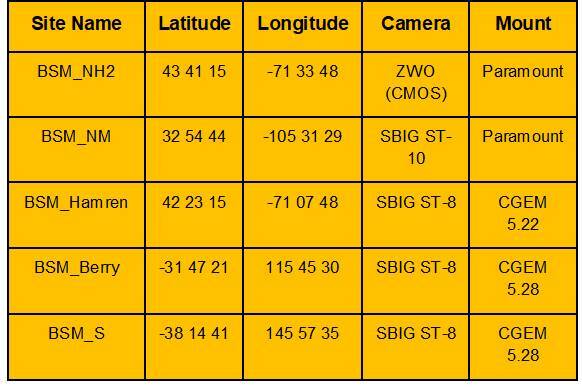 Each BSM site is equipped with a small refractor, a high grade astronomical camera (SBIG CCD / ZWO CMOS) and standard Astrodon photometric filters. They are operated robotically and are locally supported by AAVSO member volunteers. Each telescope can perform precise photometric measurements of the sky’s relatively bright stars, those in the range of 3 to 13 V magnitude. It is free to use by all AAVSO members. 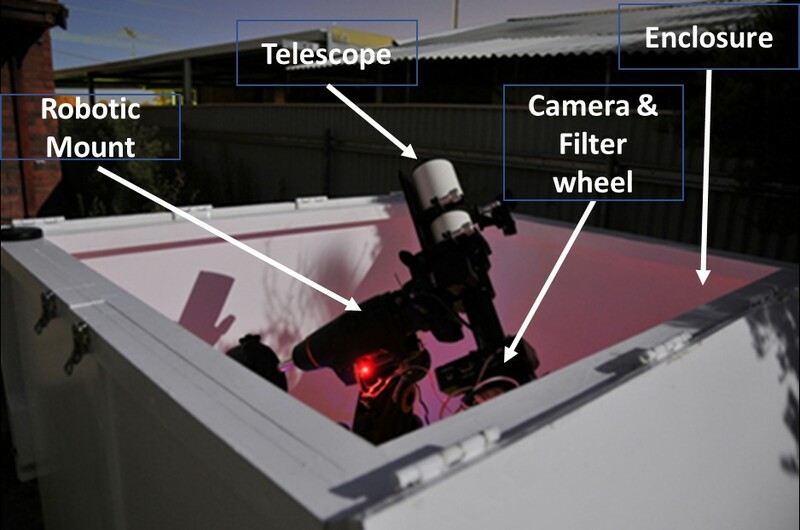 Typical Site Telescope - 50-70mm Refractor with field flattener. 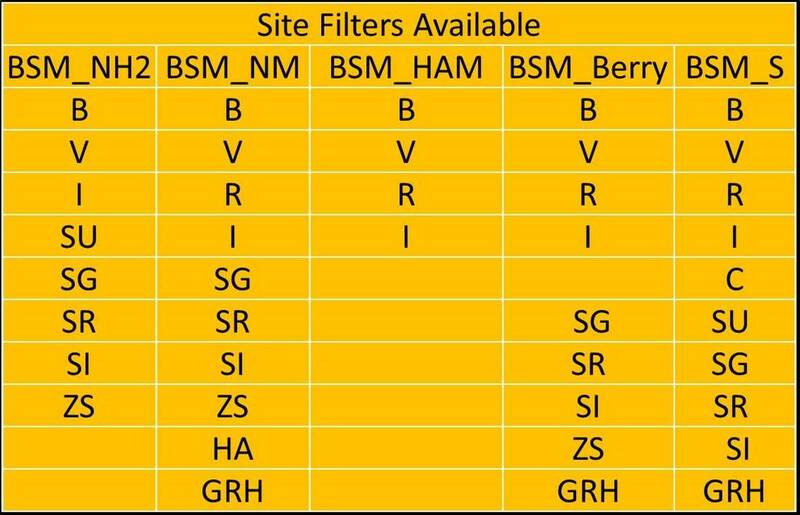 Transformation Coefficients are available for Johnson and Cousin filters. 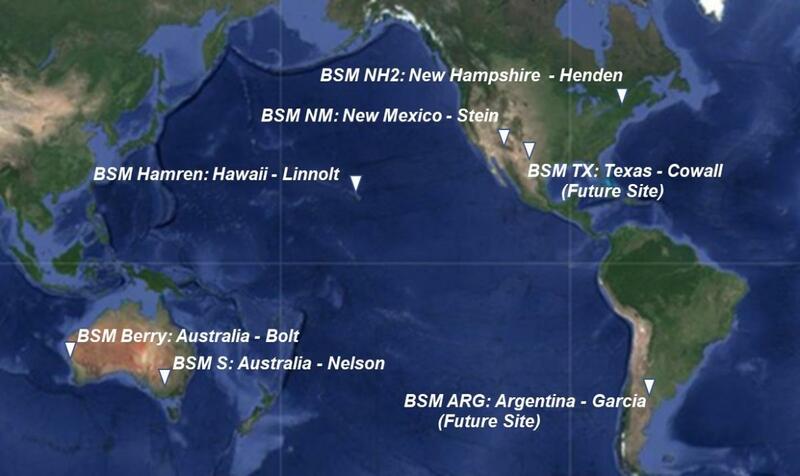 To be assigned telescope time, a BSM member simply provides a brief description of the project and the appropriate target information, using the following form, to the Telescope Allocation Committee. Target(s) name verification to ensure name is listed. To determine cadence use the following relationship: dt > (period / dmag) * e, where dt is the cadence (minimum number of days between observations), dmag, the given magnitude difference, and e, the error in one's observations. Then, for any given star of known (even if only approximately) period and range, and a given observer's average error (BSM: use 0.05) a reasonable cadence can be calculated. Example: Period = 214, Vmag range = 12.4 to 9.4, the suggested cadence is three days after truncating. In general, first determine the V magnitude exposure necessary for your required Signal to Noise Ratio and then follow this ratio: B=2V, R=0.8V, and I=0.7V. Red and Blue targets will alter this rule-of-thumb. The BSM telescopes operated unguided. At this time we typically limit expsoures to no more than 80 seconds. If you need help with your proposal, the BSM Section administrator is available through email to answer your questions. Written questions can be also submitted via the AAVSOnet Forum. Another resource is the AAVSO mentor program (https://www.aavso.org/mentor-program) which is primarily designed to pair new observers with experienced members who can teach them about observing techniques, tools, and methods, but can also be a resource for advice on target selection and interesting projects in support of educational objectives. Finally, if you are a member new to photometry, there are AAVSO Choice Courses that are available to augment your understanding of CCD observing and photometric analysis. (https://www.aavso.org/carolyn-hurless-online-institute-continuing-education-choice). VPHOT is free, easy-to-use, on-line photometry analysis software for use by members. The application and a users guide can be found here, (https://www.aavso.org/vphot). The BSM Section is requesting members consider performing the observer function for several bright star targets already part of the legacy AAVSO Monitoring Survey. These targets are moving to the latest BSM Section approval protocol. 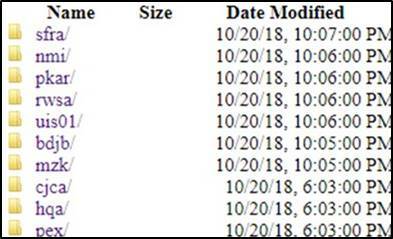 The AAVSO_Monitoring Survey is a catchall project, containing generally transient objects like PNV_J183657, campaign targets like EE_Cep or b_Per, or just targets where we've been monitoring the field for a long time and continue to do so. We ask that the adopter write a brief proposal for the Telescope Allocation Committee, perform the photometric analysis and submit the data to the AAVSO International Database. The images will be available through your VPhot account. A list of current targets is provided in the table below. Also, see the Input for the Proposal paragraph to find out what is needed for submitting the proposal. Remember that the filters, exposures, etc. for these stars have already been determined and don’t need to be identified. For the science statement, you can indicate that you are responding to this BSM Section request for these legacy AAVSO Monitoring Survey stars. Please indicate your interest in an available target by posting a message in the AAVSOnet Forum. Look for an updated table as other targets are added. George Silvis developed and maintains the AAVSO Scheduler Automation (ASA) software which is used to dispatch plans to the BSM sites with help from Cliff Kotnik.